People want bigger and better things; they don’t want to lean over old-fashioned and already seen stuff. It is a world of innovation and whosoever succeeds in this streak can earn him a big name and fame. There was uproar of S5 release and the launch was simply breath-bouncing, people kept high hopes from Galaxy makers because obviously they wanted glorified and amplified capability in the upcoming S5. I suppose that day is not far when we will be flying to some other planet on a carpet, well there is no fun here, this is realty, on earth we have experienced how technology is taking swift steps and making things simpler and easiest for us, we can’t wait and hold on to our nerves for other latest gadgets in the geek world. We never know what advancements are lined up after this massive outbreak of devices. There are certain leading big and reputed brands that are trying hard to beat down other companies with their upgraded and high class technology devices. Samsung is one of those top brands who have constantly been running in the rat race and no way behind from Apple. Samsung Galaxy S5 gives you a phenomenal experience with its latest properties and upgrades. Now you don’t have to keep a big DSLR with you, because it is not handy, S5 gives you a professional photographs’ result is much simpler way. Don’t worry if the S5 slips out of your pocket and get drenched in the rain droplets because surprisingly it is water resistant as well as dust resilient. It has built-in heart rate sensor that makes you know you heartbeat directly. The 16 MP camera is crisp sharp and of professional efficacy. The bonus is its 5.1 screen display that will show off things in a bigger and better way. 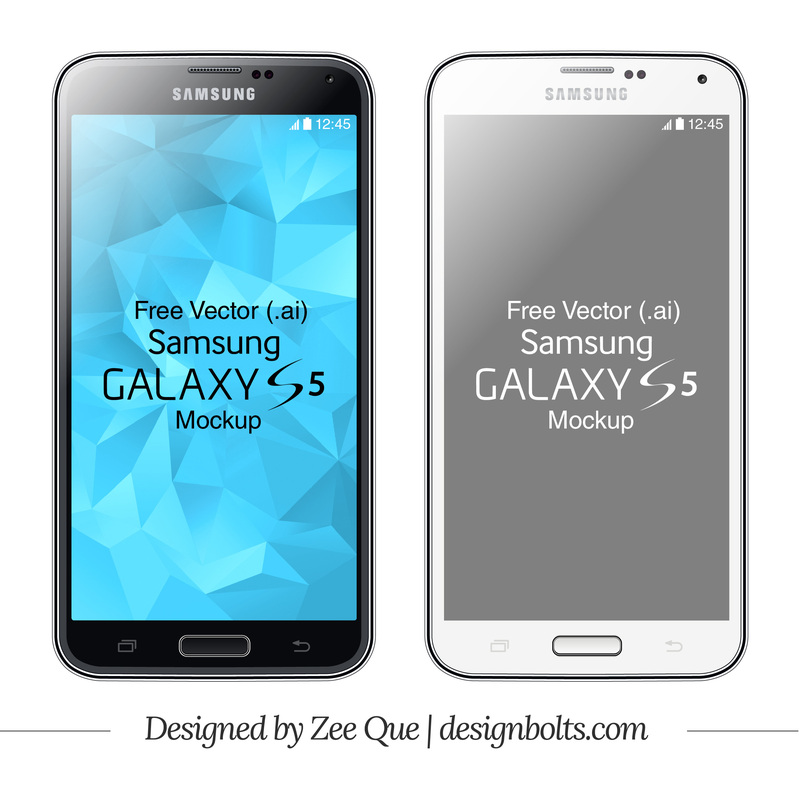 Today I am unfolding free Vector Samsung Galaxy S5 mockup in .ai Format. S5 has certainly not let down its fans with glorious and excellent chattels. It is a better version of previous train of Galaxy series. Without hiatus scroll down and get the Mockup I designed for you. Also check my previous Samsung Galaxy S4 Mockup in vector format. I think you are a rock star. This phone graphic is beautiful. Thanks for your work. You are my new hero. There should be more people in this world like you, Zee!